When you undergo a home renovation that affects exterior walls, there is going to be some damage to the yard and landscaping. In our case, our contractor had to remove the back fence and use the alley for access for the bobcat, dumpster, and all the deliveries of lumber and drywall. 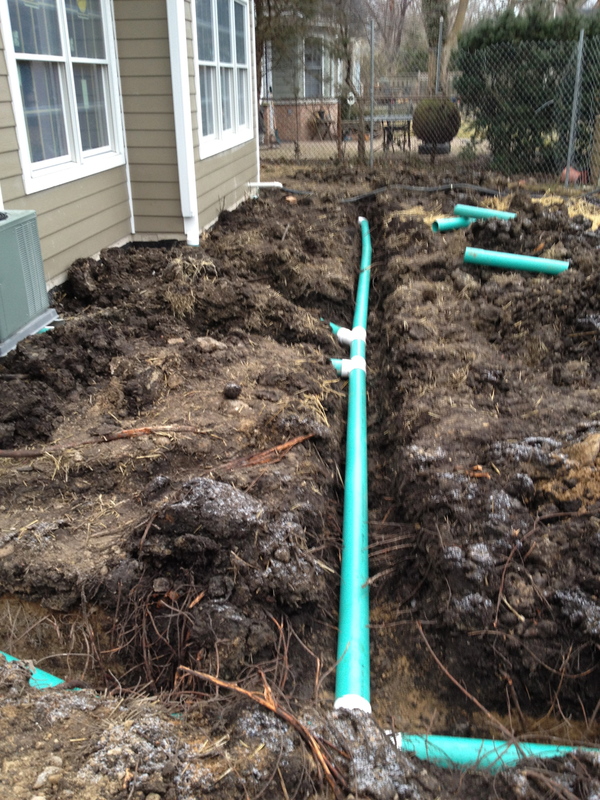 This, along with the digging of the foundation guaranteed that our back yard was gone and replaced with a giant pool of mud and clay. While the back yard was completely ruined, it was a good opportunity to do some work on our drainage situation. Before the renovation, we would get quite a bit of water in our single sump pump, most of it coming from the back yard under the concrete patio. 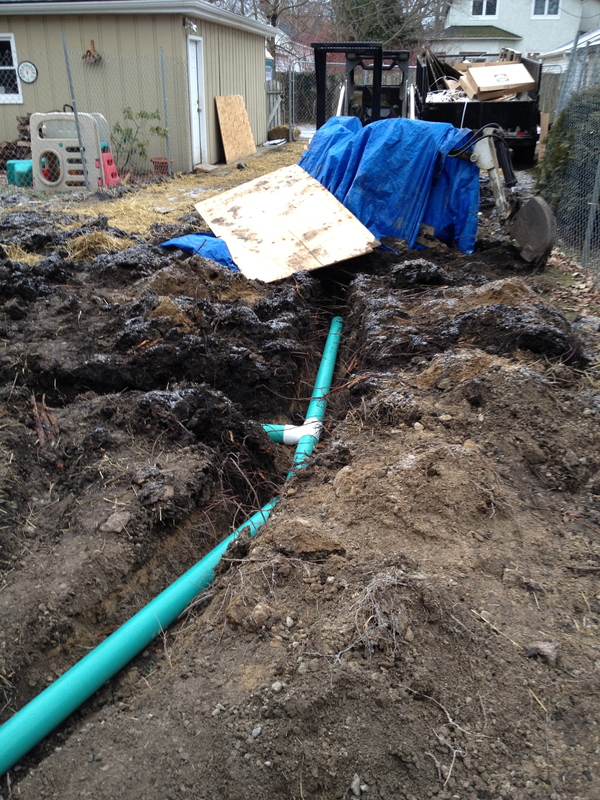 Our contractor recommended we install a french drain system with a basin at the end to move water away from the foundation and to the back of the yard. We decided to go ahead with this, and after a few nice rain storms last night I can report that it is working pretty effectively, the sump pump is running far less often than it used to. 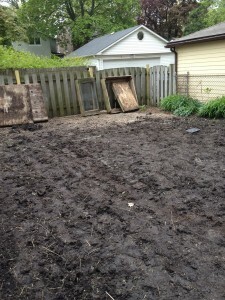 Our contractor’s commitment for exterior work was only to provide a rough grade and reinstall the back fence. We were responsible for all landscaping and any hardscaping improvements. We definitely are trying to keep this reasonable in terms of cost, so we will be taking a phased approach to the back yard. We have decided the most urgent need is to grade the yard, get some sod, and do some basic plantings. We were fortunate to get some plants from a friend’s mom who is moving out of her house, and to get a nice Japanese maple from Laura’s parents. We also have some existing plants that we dug up before construction, so we will end up spending no money on plants. We obtained two bids for the landscaping. We decided on going with our local neighborhood landscaper who does cleanup work for us in the fall. 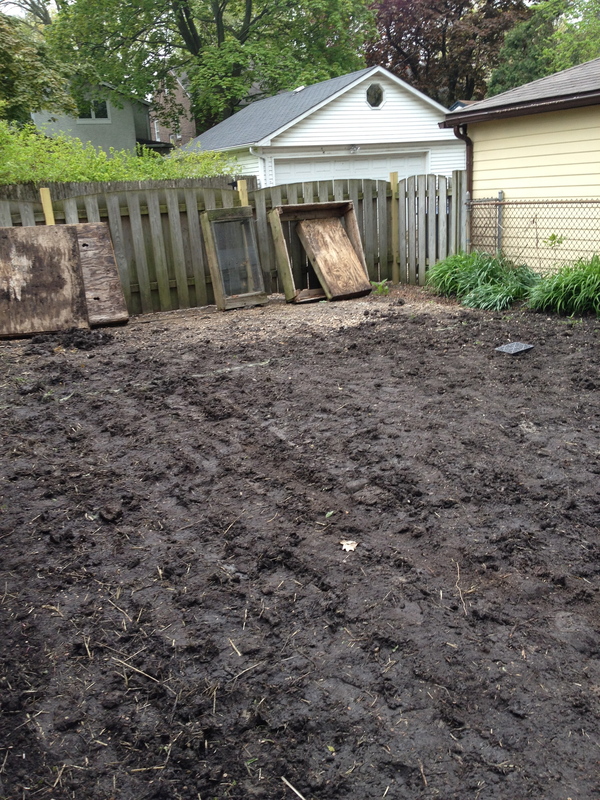 We decided on a first phase of sod for the backyard and rocks for the back 12′ where we will have our raised beds for the vegetable garden. 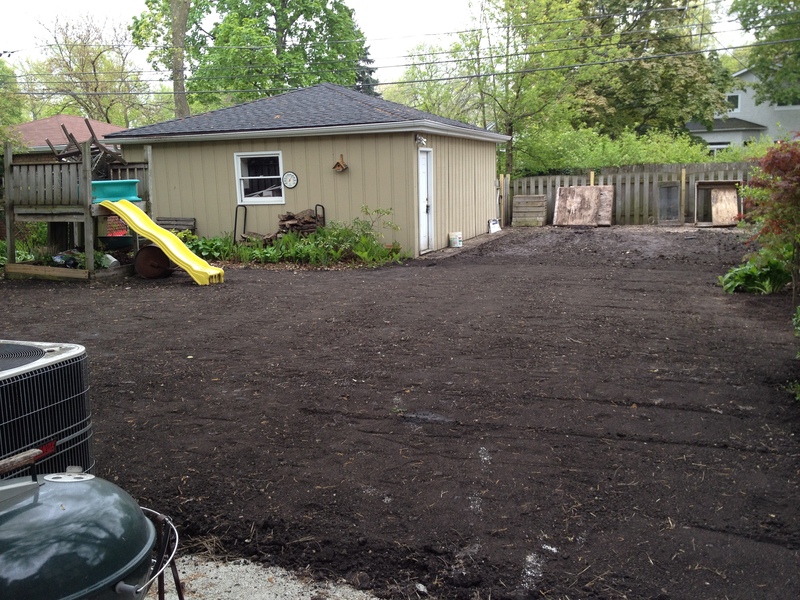 The yard first needed to be graded, then soil applied to the top of the rougher grade of clay, with sod applied to the top of the soil. As you can see in the picture, the soil is very lumpy and has quite a bit of clay mixed in. There’s no evidence of any grass remaining from before the construction. The yard went from construction site to beautiful garden in about 30 minutes! 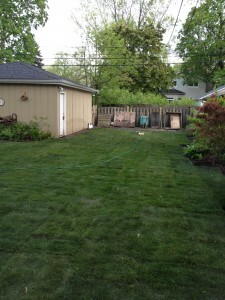 We watched as they rolled out the sod, the yard was transformed. After a good watering and a heavy rain it is pretty wet, but the grass did a great job of soaking up the water and it looks fantastic. 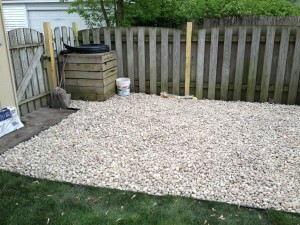 In the garden area, the landscapers laid out plastic landscaping edging and weed barrier with about 3″ of river rock. 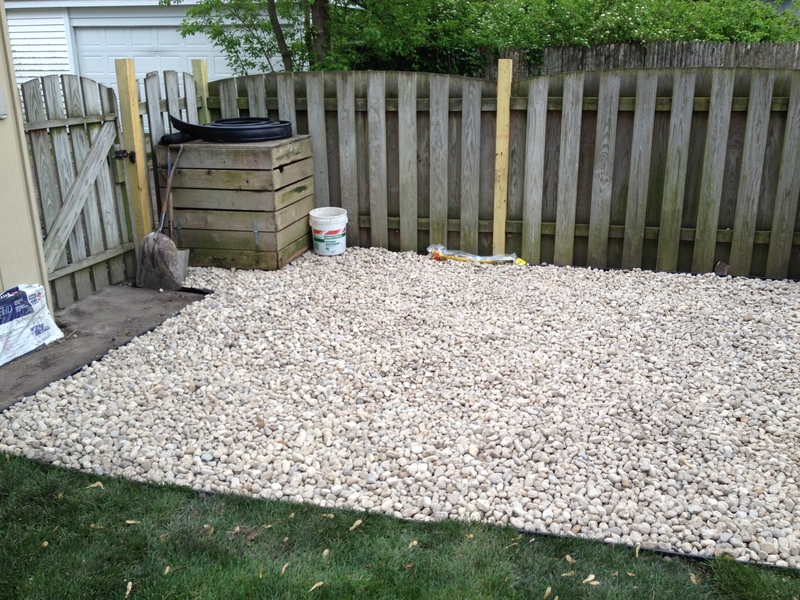 I’ll be putting the raised beds on top of this gravel with about 2″ in between each bed. This will cut down on all the weeds I had growing up into my garden beds the last few years. I’m really looking forward to getting the garden going soon.